The main objective of the project is to install a new wellhead platform, WHP-3 at a location approximately 2 km northwest from the existing NFA complex. 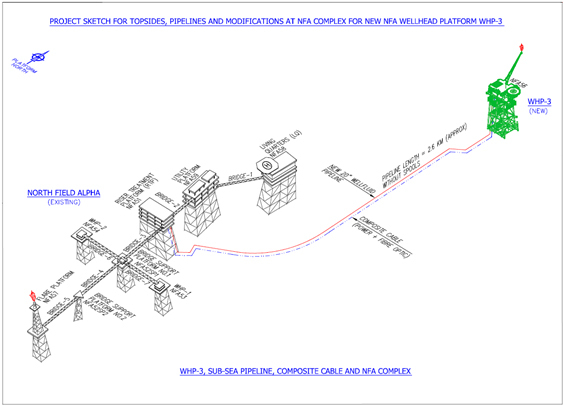 The full well stream fluid (gas + condensate + water) from WHP-3 will be routed to the existing NFA platform via a new subsea pipeline where it will be commingled with the production from the existing wellhead platforms and conditioned for export. INTECSEA’s scope of work on the project covers the pipeline and subsea composite cable including risers and J-tubes at both platforms. The pipeline is a 20” high pressure/high temperature pipeline, internally cladded due to severe sour service. The composite cable is planned to be piggybacked to the pipeline. Scope included route development, pipeline design incl. lateral buckling and walking assessment, preliminary installation assessment, riser and spool design and analysis, J-tube design, development of project specifications, data sheets and material requisitions for long lead items.